Arlington Transit is prepping 13 new buses to start picking up riders in the coming months. 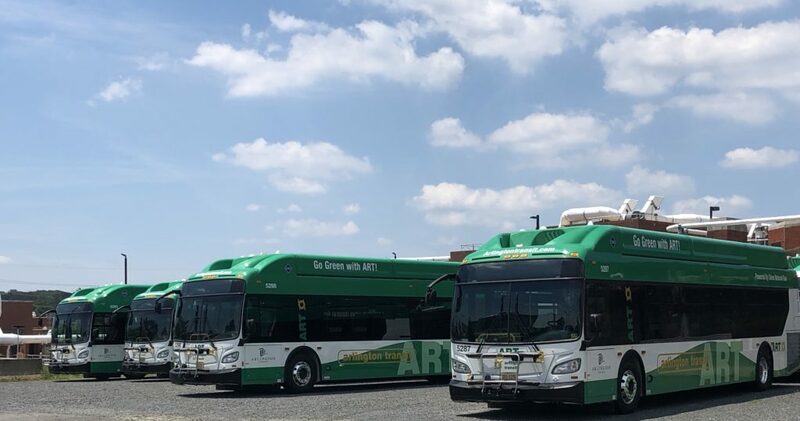 County transportation spokesman Eric Balliet told ARLnow the bus service received the new vehicles a few months back, and hopes to have three making the rounds before the month is out. He expects the rest will hit the road as the county continues to beef up bus service in the coming months, likely “later this summer/early fall,” as part of the Transit Development Plan the County Board approved in 2016. That plan is designed to bridge gaps in bus service around the county, particularly along Columbia Pike, where ART and Metrobus just started teaming up to offer enhanced service last month. ART has also dealt with a series of mechanical issues recently, particularly on some of its older buses, but Balliet says the county is still being cautious in putting these new buses in the field. The 40-foot-long, natural gas-powered vehicles are the first buses the county has purchased from New Flyer of America, the same company that provides vehicles to WMATA for much of its Metrobus service. Accordingly, Balliet says ART’s service contractor “has been in the process of reviewing the buses for acceptance and training operators and technicians” since the agency got its hands on the buses earlier this year. In all, the county’s Transit Development Plan calls for ART to expand its fleet “by over 20 vehicles” in total through 2026. The county projects that these additions and service changes will help it boost ridership by 24 percent over the same time period, though ART’s ridership figures have flagged in recent months, similar to other bus services nationwide.